MELVILLE, N.Y., March 28, 2019 — (PRNewswire) — Instant gratification – it's what we crave – so take your pick from the more than one trillion photos taken in 20171 and print and stick 'em! Canon U.S.A., Inc., a leader in digital imaging solutions, is excited to announce the next generation within the IVY product lineup, the IVY CLIQ+ Instant Camera Printer + App connectivity and IVY CLIQ Instant Camera Printer. The new IVY products are lifestyle products for the everyday photographer who wants to snap and print stick-able memories – in an instant. 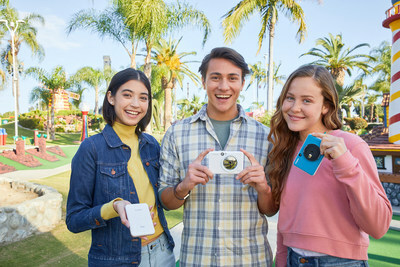 "IVY, though tiny in size, has made a big impression this past year among Gen-Z and Millennials who have a passion for taking photos, expressing their individual style and instantly printing and sticking their moments," said Kazuto Ogawa, president and chief operating officer, Canon U.S.A., Inc. "We are excited to bring these everyday innovations to younger generations as a medium to channel their creativity and share with family and friends." Don't fret – there is no shame in your picture snapping-and-printing game. Boasting an eight-megapixel2 camera, the CLIQ+ Instant Camera Printer + App connects via Bluetooth4 to the Canon Mini Print app3, which features a variety of photo design options such as filters, photo frames and text to provide a multitude of opportunities to create fierce photos. Through the app, users can also customize their experience by recording their own on/off and shutter sounds. Users can even set up remote shooting for the ever impressive group photo. Adding a pop of color to everyday life, the CLIQ+ is available in colors such as Pearl White, Sapphire Blue, and Ruby Red and includes fresh features such as 2x2 and 2x3 printing options. Don't forget – momma said, "sharing is caring" and with the CLIQ+'s reprint option, users can print one photo for themselves and one for a friend. For further shooting flexibility a Micro SD card slot is available along with a selfie mirror surrounded by a glowing light ring of either four or eight LEDs, providing the right amount of glow-up to make the user's photo pop. 'Cliq' and print: it's an easy two-step process with the new five-megapixel2, automatic-flash IVY CLIQ Instant Camera Printer, which is available in colors such as Bumblebee Yellow, Seaside Blue and Lady Bug Red. This new instant camera can print 2x2 or 2x3 stickers and when the ideal moment presents itself, the selfie mirror helps ensure the insta-worthy snap is perfectly positioned. The CLIQ also has a Micro SD slot, allowing users to upload photos to their laptop or PC for future projects. The Canon IVY CLIQ+ Instant Camera Printer + App and Canon IVY CLIQ Instant Camera Printer are scheduled to be available for in-store purchase in April 2019 at an estimated retail price of $159.99* and $99.99* respectively, and each camera/printer includes a starter pack of 10 sheets of 2x3 photo paper. For more information, please visit usa.canon.com. Canon U.S.A., Inc., is a leading provider of consumer, business-to-business, and industrial digital imaging solutions to the United States and to Latin America and the Caribbean markets. With approximately $36 billion in global revenue, its parent company, Canon Inc. (NYSE: CAJ), ranks third overall in U.S. patents granted in 2018ï¿½nbsp; and was named one of Fortune Magazine's World's Most Admired Companies in 2019. Canon U.S.A. is dedicated to its Kyosei philosophy of social and environmental responsibility. To keep apprised of the latest news from Canon U.S.A., sign up for the Company's RSS news feed by visiting www.usa.canon.com/rss and follow us on Twitter @CanonUSA. 3 Requires mobile device to be connected to the Canon IVY CLIQ+ Instant Camera Printer + App via Bluetooth® and the Canon Mini Print App, available for free on the App Store and at Google Play. To access, download and/or use the Canon Mini Print App and related services, you must be located in the United States and be at least the age of majority in your jurisdiction; additional terms and conditions apply, see Canon Mini Print App End User License Agreement for full details. The Canon Mini Print App is compatible with mobile devices running iOS 9.0 or later, and Android devices running Android 4.4 or later. 4 Compatible with select smartphone and tablet devices (Android™ version 5.0 or later and the following iOS® devices: iPhone 4s or later, iPad 3rd gen. or later, iPod Touch 5th gen. or later) equipped with Bluetooth® version 4.0 or later and the Canon Mini Print App. This application is not guaranteed to operate on all listed devices, even if minimum requirements are met. *Availability, price and specifications are subject to change without notice. Actual prices are set by individual dealers and may vary.